Change agents are those whose radical, innovative ideas are not internally understood –and the culture of the company resists change that could conflict with existing business models. In our research, we tested to see if technology adoption, relationship with startups, or if understanding new trends would have been a primary cause of challenges –yet over and over, we heard that internal culture was the primary issue. As part of Crowd Companies’ research for “The Corporate Innovation Imperative” (available for you to download here), we surveyed individuals responsible for innovation within their organizations. 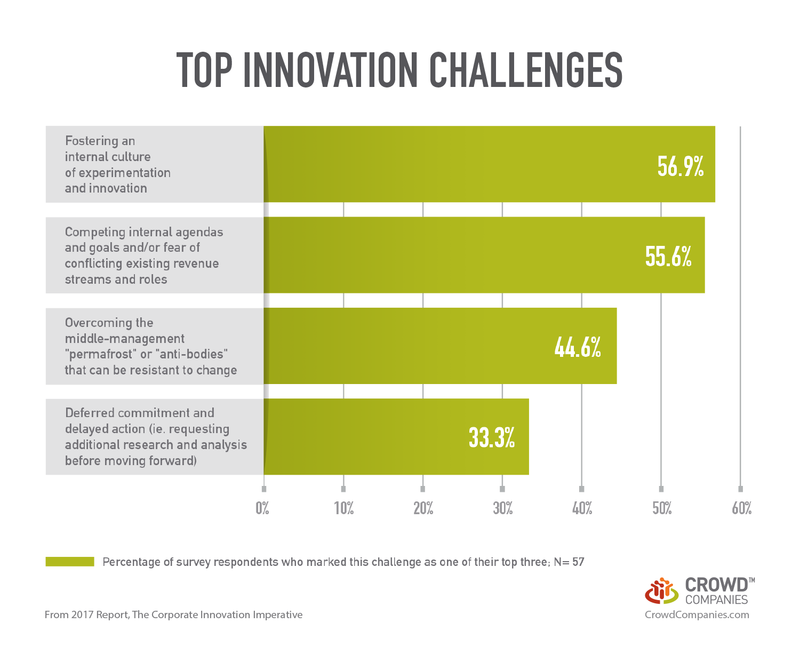 Survey results (below) show that the top innovation challenges include: fostering an internal culture of experimentation and innovation (57%); juggling competing internal agendas and goals (56%); overcoming the middle management “permafrost” layer (45%); and moving forward despite deferred commitment and delayed action (33%). Our research also included interviews with innovation leaders and strategists from large corporations. During our interviews, we uncovered two additional challenges: keeping up with startup innovations and a steering progress with a lack of clear business goals. Foundational culture change is required to make significant progress. Innovators first focus on internal education as a catalyst for cultural change, from external speakers to internal workshops, first at the executive level and then targeted toward other senior leadership. Innovation excursions are also helpful in the initial stages of program development to align executives and teams around what’s possible. Middle management “permafrost” doesn’t support innovation. A symptom of a culture resistant to innovation is a middle management layer that can only see short-term goals, not long-term change. As a result, they encourage employees to operate efficiently within their current roles and responsibilities by meeting consistent benchmark metrics. This doesn’t leave room for the innovators to explore new ideas. We heard this middle management layer called everything from the “frozen tundra” to the “permafrost” to the “antibodies.” It’s critical for senior leadership to embrace innovation from the top down, so middle management is empowered to support innovative employees without fear of retribution. Startups innovate quickly, leaving corporations playing catch-up. Many companies are burdened with complicated processes, long production cycles, and bureaucratic red tape for moving forward with new ideas. These hindrances stand in direct contrast to the countless nimble startups swiftly prototyping and executing ideas that directly compete with slower-moving enterprises. Innovators commonly turn to educational workshops (in-house or at vendor locations) and university partnerships to speed internal innovation, as well as innovation outposts. Companies lack clear business goals for innovation programs. Corporate innovation leaders, who we’ve published more data about their role here, are tasked with tying programs to business metrics and proving ROI to executives, yet they often lack the budget needed to adequately resource said programs to an extent that generates results. There is hope for innovation, though. Our survey revealed four innovation programs with more clearly defined business goals: dedicated innovation teams, innovation outposts, innovation “centers of excellence,” and startup investment programs. Mature companies are even defining innovation goals by individual program, while simultaneously laddering metrics up to overarching departmental and company KPIs. Companies need to clear the obstacles for Corporate Innovation leaders. The Corporate Innovation teams are often struggling with internal conflicts –more than combating external startups. When I’ve spoke to these leaders, they are willing to risk their jobs to make a change to help innovate their employer, some said “I’m banking on my employability, not my employment” as they knew they could get jobs elsewhere if it didn’t pan out. It’s key that management help offer them a road towards innovation success. Also, read Steve Blank’s list of the 13 things companies are doing to hamper innovation, or Stefan Petzov of Swisscom’s post on corporate challenges.